Be sure to run Automated Contract Billing (or Formula Billing) so each family has a balance due. If you wish to process just certain families (such as weekly versus monthly payers) you’ll need to Set Up Account Tracking and Assign Tracking to Families ahead of time. From the main screen of Family Data & Accounting go to Tuition Express > Process Tuition Express. If you accept online payments from families and there are any online batches waiting, you’ll be alerted to Post Online Batches first. Otherwise, continue with the steps below. You may make a one time change, if needed, to the ACH Batch and Credit Card Batch descriptions. These descriptions will default to the items selected when you first Set Up Tuition Express. You may click the Client List button (lower left) to get a quick summary of each payer’s Start Date, Max Amount and whether Batch Payments or Online Payments are allowed. Optional: To process accounts in a specific category (such as parents who pay daily vs. monthly) use the Filter Accounts button. For details see: Filter Accounts. Skip this step if you want to process everyone that has a balance due. c1. Click Filter Accounts (bottom center). Note: Although all accounts will appear on the processing screen, you’ll only be able to process payments for those in the selected group(s). Once you have made any optional selections, click Next. Select the families you wish to process for ACH payments (if any) and edit the amount if needed (amount may be lowered, not raised). 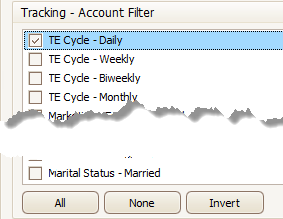 Place a check in the column header to select all accounts or click just to the right of the check box to sort according to which families are selected and which are not. Hint: If no families are shown it may mean they have not yet been approved, no family has a balance due, or that today is BEFORE their Tuition Express Start Date. Select persons paying by credit card (if any) and click Next again. Note: If you have only credit cards or only ACH, you’ll have just one screen on which to select families. Hint: Click a heading, like Type, to sort that column. This can be useful if you want to process some types of credit cards separately. Review the Batch Summary (top of screen). If changes are needed click the Back button. Choose a Requested Processing Date up to 14 days in the future (may be helpful if you will be away on vacation). 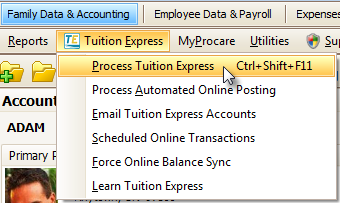 This feature is enabled when you first Configure Tuition Express. A message will appear on screen when the batches have been successfully transmitted. Click Exit. Note 1: At this point, payments have been posted to each account Ledger Card with the “Batch Confirmation Number” in the Comment box. ACH transactions (from checking & savings) will have a separate batch number from payments made by credit card. Note 2: The current balance for each Tuition Express family has also be updated at TuitionExpress.com. You’ll receive the following email receipts. Batch Received: An email confirming receipt of the batch will be sent to the email address(es) of record shortly after Tuition Express receives your transmission. Each batch must be received by 1:00 pm Pacific Time to begin processing the same day. Bank Deposit: Within 2 banking days a second email will be sent confirming the deposit(s) to your account and showing transaction fees that will be deducted from your account. You may Change or Cancel a Batch or issue a Credit Card Refund, if needed. When should I use Process Automated Online Posting?